For the past several years, weather has wreaked havoc on high school teams. 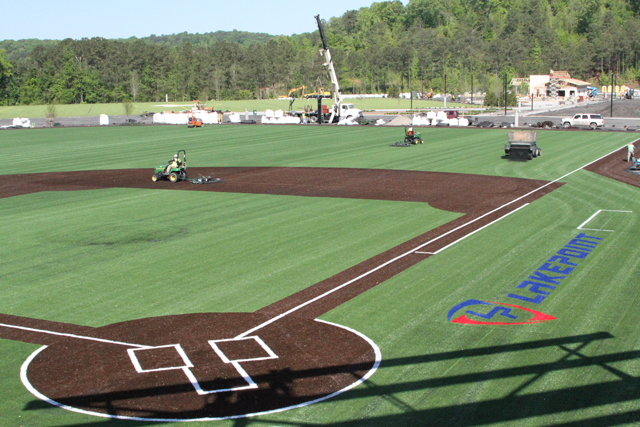 However, beginning with the 2020 season, the Georgia Dugout Club will be working with Prep Baseball Report (PBR) at the Lakepoint Complex to alleviate some of those problems. On February 14-15 and February 21-22, 2020, the Georgia Dugout Club will take a monumental step to make it one of the finest high school baseball tournaments in the country. All games will be played at the eight-field Lakepoint Complex in Emerson, Ga. in order to virtually assure you will get to play your games. We extend a special thanks to Matt Yarber and PBR for their partnership in making this happen. They will contact all professional and collegiate scouts to promote the tournament, and they will also contact schools outside the state of Georgia to see if they are interested. 1. The first 32 teams to contact me at harveycochran@comcast.net will receive first choice. Tell me what weekend you would like to play (you can also play both weekends), include your cell phone number and school name / classification. 2. Single Game on Friday night; Doubleheader on Saturday. 3. A non-refundable $350 entry fee will cover umpires and field expenses. Each team will provide three baseballs per game. This fee is due with your clinic fee and dues no later than December 15, 2019. Send to: Harvey Cochran, 3193 Battle Park Way, Marietta, GA 30064. 4. Four team brackets on eight fields = 32 teams. A trophy will be presented to each bracket winner at the conclusion of the tournament. Once you are accepted to the tournament, you must remain committed. You will receive your schedule before September, so it is vital that you not change your mind once you have applied - this would have a negative impact on other schools. We anticipate this tournament will fill-up quickly, so do not delay. Thank you for all you do, and hope this is a way to grow the club’s activities even more.